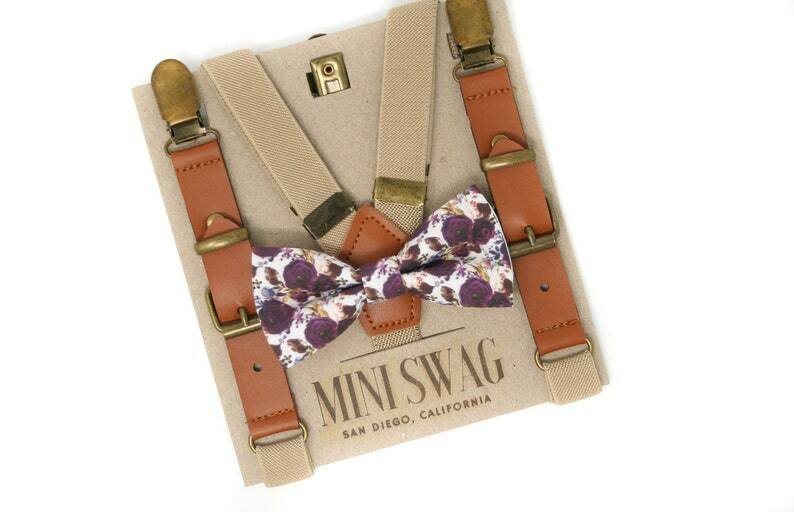 Your little guy will be the talk of the party when he shows up wearing this gorgeous plum floral bow tie & leather suspenders set! Perfect for Groomsmen, Ring Bearers and Page Boys, 1st birthdays, cake smashes, wedding or other special occasion. This 100% cotton bow tie features watercolor flowers in shades of purple and plum. The bow ties come in 2 attachment options- on an alligator clip (best for squirmy little guys) or an adjustable elastic neckband (best for older kids). See images. Adult bow ties come on an adjustable fabric neckband. The bow tie was exactly as pictured! It is well made and I received it right on time. I look forward to purchasing more items from this shop!